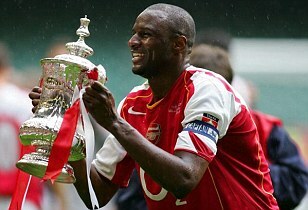 Former Arsenal skipper Patrick Vieira is in line for a sensational return to the north London club after manager Arsene Wenger sounded him out about the job of replacing Liam Brady as head of youth development. Vieira, who won three Premier League titles and four FA Cups under Wenger, has joined fellow Gunners legend Dennis Bergkamp on a shortlist of potential candidates for the post of nurturing the next generation of stars. Vieira is Manchester City's football development executive, a post he has held since 2011. However, the thirty six year-old former French man is understood to be tempted by a reunion with Wenger and the chance to return to work on the training pitch rather than continue with the largely ambassadorial role he performs at City.